Click the image to go to that page and info! Find a class in your area. Once you find the class you want to take, go the Instructors page to get additional contact information and a little history on the instructor. Please call if you are interested in hosting a class in your area. Home Study Course is available too! If you don’t find a class near you, check out our Home Study Course. This three day introduction class provides the foundation for learning the Foot Zone Balance technique. The class also presents the establishment and history of Foot Zone. You will learn the “ Body Map ” on the foot and discover the relationship of the map to your physical body. Upon completion of this class the students will have the knowledge of how to apply a total Zone Balance following a flip chart as well as an understanding of how to assess clients and how the treatment works. This in-depth class studies the Endocrine and Digestive Systems , their functions, ways we can strengthen them and repair past damage. During this class you will learn specific placement and treatment of the Endocrine and Digestive organs and what you are feeling as you treat these areas of the feet. You will learn to listen to what the feet are telling you about the condition of the body. You will learn about hormones and how they affect the body as a whole and how food is processed to nourish the body. This class studies the Structural and Nervous Systems , their functions, ways we can strengthen them and repair past damage. 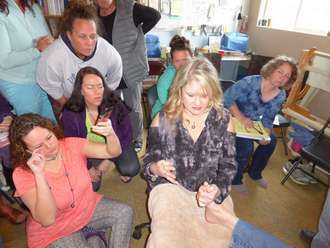 During this class you will learn specific placement and treatment of the Structural and Nervous system organs and what you are feeling as you treat these areas of the feet. You will learn to “listen” to what the feet are telling you about the condition of the body. You will learn about the bones and muscles that give structure to our bodies as well as the signals that provide cellular communication. This in-depth class studies the Excretory (Elimination) and Circulation Systems , their functions, ways we can strengthen them and repair past damage. During this class you will learn specific placement and treatment of the Excretory and Circulation organs and what you are feeling as you treat these areas of the feet. You will learn to listen to what the feet are telling you about the condition of the body. You will learn the importance of detoxification to the body and how proper circulation can provide rejuvenation to the body. The Final exam is offered to “ Certify ” that you have completed the entire class and can demonstrate an understanding of the information. The exam consists of a review, a test, a hands-on quiz and a brief oral review with the instructor. Once you have completed any of these classes, you may retake the class for $100.00. AFZT also offers an annual advanced training retreat in September. The conference lasts 3 days and is designed to keep Foot Zoners and Instructors on the cutting edge of their field.